You are all so amazing! I can't believe that I now have over 200 followers! You know what that means? Giveaway time!! I really appreciate all of you stopping by my little corner of the blogosphere and for being so encouraging and supportive! Plus this giveaway marks another celebration for me. I just started an amazing new job this week and I am absolutely loving it! So this is titled the 'Pattern Giveaway of the Century Part 2' and like last time, I'm giving away one pattern for each decade from the 1930's to the 1960's. All you have to do to enter is be a follower of this blog and leave a comment below by Wednesday the 13th of October. I'll announce the winners on Friday the 15th and will ship your pattern to you anywhere in the world! 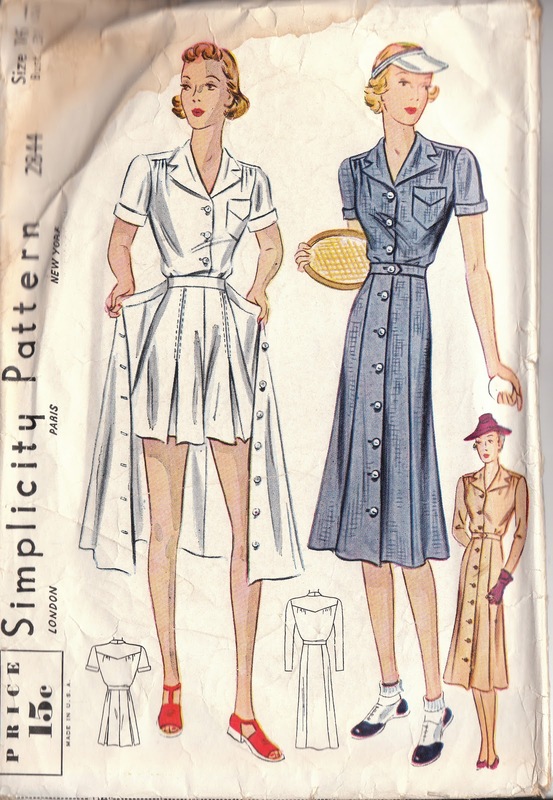 From 1930's is Simplicity pattern #2844 for an adorable tennis/exercise outfit that includes a blouse, shorts and matching skirt in a size 16 (Bust 34). I absolutely love the skirts that open up to show matching shorts underneath. Perfect for autumn or spring! Here's a pattern for everyone! 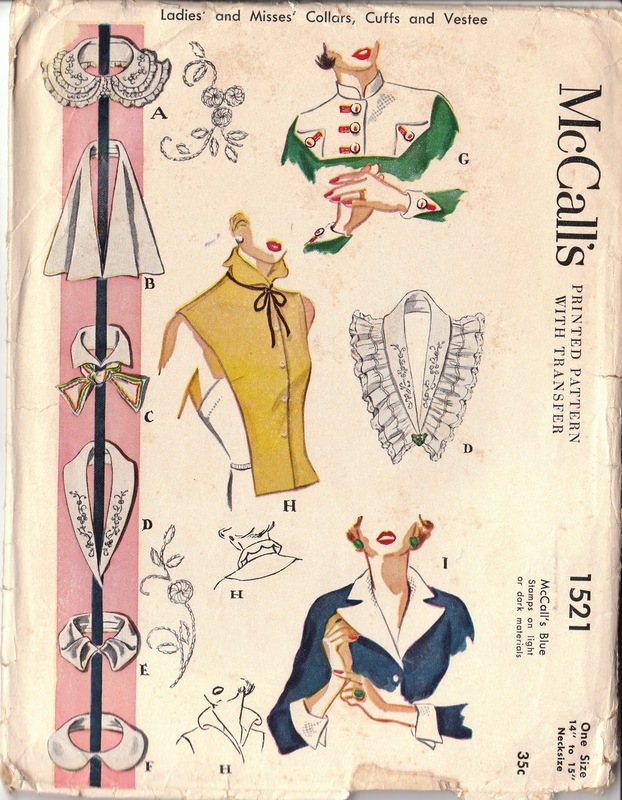 From the 1950's (1950 to be exact) is this set of collars from McCall's 1521. It is in a size 14" to 15" necksize. Just leave a comment on this post by Wednesday the 13th of October and let me know which pattern you would like. You can say "all of them" and I will enter you into the drawing for each separate pattern. Enter me in them all! Made a post on your giveaway, too! Such fun. May I please enter from the 30s through the 50s please? LOVE them and thanks! Here's a second for the 30's through the 50s. They're so fun! I'm going for the 1930's and the 1950's. i'd say the 60's too but it is kinda similar to the one I won last time!! Speaking of, I found a fabulous lime green and turquoise plaid for the jacket, maybe sounds a little crazy but its great! Enter me for the simplicity 6933... love the coat! And love reading about your vintage sewing experiences. I love the collars! Please enter me for them! I am too preggo to take the others right now! I can't sign into my google account due to family mess email things, and I don't know how to make your blog think I follow you in any other way, but is there some way I can enter anyway? I would love any and or all of them. Hi there, I'd like to enter for the collar pattern... I would really love to start vintage sewing , but until now I'm afraid that I won't understand the instructions! You show in your blog that it is possible, so I hope I win and can try my luck! Congratulations! You totally deserve every single one of the followers you've got! And, erm, I can't choose so I'm going to be greedy and ask to be entered for all of them! Congrats! your blog is really cool! I would like to be in the drawing for all the patterns - they are just lovely all of them! The 1930's pattern is my favourite. Hello Debi, I'd like to enter your giveaway for the 6019 suit :) Congrats on your blog being so popular! Please enter me for all of the above! Congrats on the job & the 200 followers! Please enter me for all of the them, they are all so nice. Oh my God! you have a lucky star! Congratulations on your new job and your fans, you deserve it. I would like to enter the 60s pattern and collars, I am ambitious? I can not choose. Now I'll put a post announcing the giveaway. Thanks and congratulations. Enter me in that 1930s pattern group please! Yay! Congratulations on both the job and your blog! I'd like to be entered in the 1950s giveaway please. Please, consider me to all. The patterns are just lovelly. Really like your blog. Would love to be entered into the collars and the office outfit! I can just imagine using the office pattern and making up a cute outfit to wear to my own office job. Thanks for hosting this! Looking forward to seeing more of your blog. All of them, please. These are great! What a generous giveaway! Lovely patterns. Can I please enter for the fabulously 60s Simplicity #6933? Hey Debi, congratulations on the new job and the 200 followers...both are great achievements! I would absolutely love to be entered for the 1940s gorgeous suit and the 1950s cute collars!!! I've been looking all over the place for patters on collars and never find any! McCall's 1521 is the one! I ADORE the '60s coat and dress... and the pattern is my size too! I would like to be entered for the above pattern. Many thanks!! Oh, enter me in for the 30s, 40s and 60s (the collars just leave me a little cold). This giveaway is great! Another one for the 1930-50s group, please! These are such nice patterns, and they are in my size. Thanks for the giveaway. I am a follower. I know you already know that. I'm a follower now and I love all the patterns, please enter me for all of them! I would love to enter for the 50's collar patterns. So freakin' cute! And I really really want to make Peter Pan collars! All of course.... congrats on the job and the 200 followers! Please enter me in for the 30s-50s patterns. 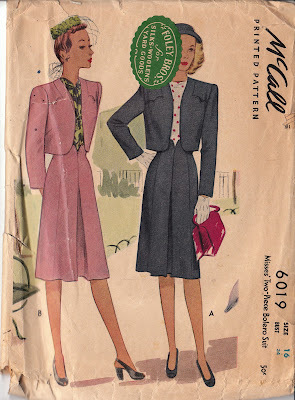 I would like the McCalls suit or the Simplicity dress and jacket pattern. Just come across your lovely blog today. What a fabulous giveaway! I would love either the '30's one or the '50's one, they are just gorgeous! Just started following, look forward to reading about your sewing adventures. I want I want. I'm a pattern hoarder. Love all your stuff! 50's or 40's please! Love the patterns that you are giving away, especially the 30s tennis outfit and the collars! All of them!!! And I will send you a link when I post a link on my own blog. Debi - They're all lovely patterns - but no need to enter me. I just wanted to say congrats on over 200 followers! I remember when you were excited about 100, and that wasn't that long ago. Maybe by the time you hit 300 (or 400?) I will have finally learned to sew - and then I will happily have you throw my name in the hat. LOVE that gorgeous knit top with peter pan color, by the way. Those colors are perfect on you. Could you enter me for them all please? Thanks! Each week on the blog, I post new listings with an additional 10% discount code for one week. I hope I win!! I love the collars particularly, but like them all. 1930s, 40s and 50s please! :D I've had you on my google reader for a while - but have also hit the 'follow' button in case that doesn't show up. I recognize you from Fedora Lounge, I've been trying to add blogs from there as I'm sewing/vintage fashion blog addicted. The neck and collar pieces please! I also realised I wasn't following you, silly me! So lucky you had a follow giveaway! Love the patterns! Please enter me in "all of them". Collars and cuffs and "Exercise outfit," please? Just saw you on Sew Retro, lovely blog! Please could I enter for the 1930s sports suit, 1940s suit and the collars/cuffs set? Love your blog - can you please enter me into the draws for the 1930s, 40s and 50s patterns? Thank you! ooh! 30s through 50s please!! I'd love to try for the 30s pattern! I discovered your blog through the sewretro blog and love what you do (and you are very productive, too, which I admire). 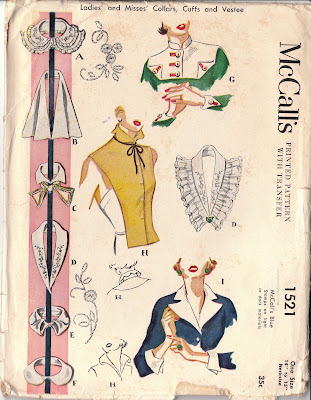 I would be sooo happy to get the collars pattern (1950). I love the Mod one at the end: 1966 Simplicity #6933 with a one-piece go-go dress and fabulous coat. Size 16 or Bust 36. I love them all - I'd be pleased to get any one of them! Wow! They are all beautiful aptterns. The collars are spectacular! i love the 40s and 60s patterns, so cool! I'd love to win the 30s, 40s or 50s patterns! They're all so lovely! Congrats on reaching 200 followers! Oh wow, another 100 already! Hardly surprising with all your gorgeous projects, I really need to get myself into gear and finish some projects! I have resisted entering but I might just have to be cheeky and enter for the 30s thru 50s. 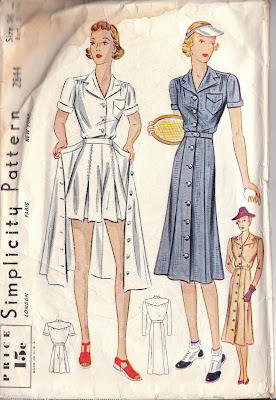 I got outbid on the very same shorts set from Simplicity (http://vintagepatterns.wikia.com/wiki/Simplicity_3607_A) and I am loving that unusual skirt shape from the 40s. Hello! 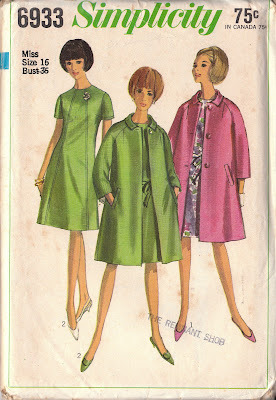 I've already entered once, but have mentioned your great giveaway on my blog, so would like to submit another entry for the 1960s Simplicity pattern #6933.